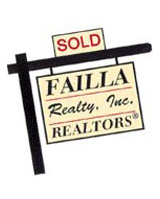 Why Select Failla Realty To Help You Sell Real Estate? This section is designed to assist home sellers. Selling your home can be a complex process. As a seasoned area listing office, we will help you with the entire home selling process. As your listing office, we will help you get the best price for your home and help sell it in the fastest possible timeframe. Provide you with a home valuation to help determine your home's worth. Engage in a comprehensive campaign to give your home the ideal amount of exposure. Utilize technology including our professional web site to showcase your property to other real estate agents along with potential home buyers. Are you considering selling your home now? We can help. Please fill out the simple Home Sellers Request Form below to receive an analysis of your home. Please note, your information will be kept strictly confidential.